is a work of art concei­ved by the leg­end­ary art­ist, musician and peace advocate Yoko Ono as a beacon to world peace. The work is in the form of a wis­hing well from which a strong and tall tower of light emer­ges. The words ‘Imagine Peace’ are inscri­bed on the well in 24 world languages. The light tower is composed of a num­ber of indi­vidual lig­hts that join toget­her to form a single beam. Six of the lig­hts tra­vel through corridors across a plat­form that surrounds the well and are ref­lected upw­ards to the sky with mirr­ors. The strength, intensity and brilli­ance of the light tower cont­inually changes as the partic­les in the air fluctuate with the prevail­ing weather and atmospheric conditi­ons unique toIceland. This idea for the Imagine Peace Tower comes from a conceptual artwork by Yoko Ono, entit­led ‘Light House’. For deca­des Yoko Ono has gat­h­ered the wis­hes and dreams from people all over the world. These wis­hes are kept in time-capsules. The Imagine Peace Tower is surrounded by more than half a million Peace Wishes from people worldwide that the art­ist has col­lected since 1981 as part of her interactive Wish Tree exhi­bits. The wis­hes are stored in capsu­les and buried surround­ing the Imagine Peace Tower. 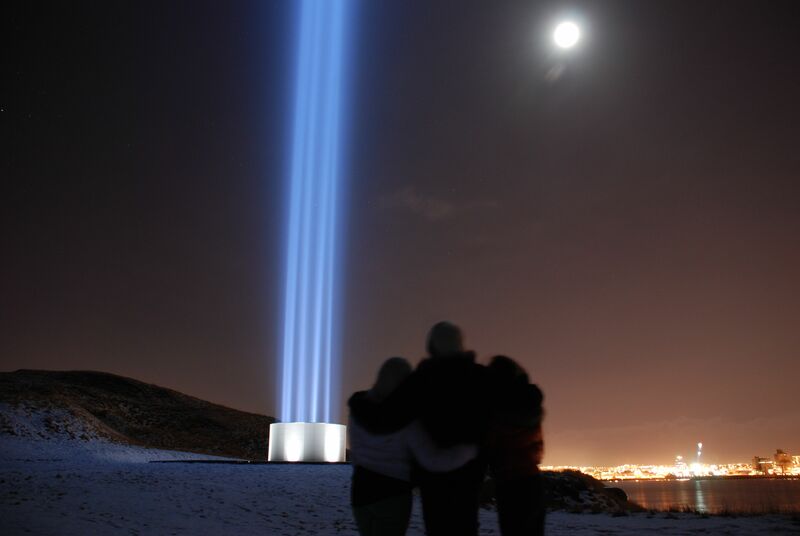 Yoko Ono invites you to join her and hundreds of thousands of oth­ers by send­ing your wis­hes to the Imagine Peace Tower, Po Box 1009, 121 Reykjavik, Iceland. It is lit from around 1 hour after sunset until midnight each night except on John & Yoko’s birthdays and on New Year’s Eve, when it remains lit until sunrise. On 9th October and 20th – 27th March it lights at 8pm.